We didn’t get a chance to hear this horn, because it was inoperative out of the box when brand new. Based on this and our experience with the other Stebel Nautilus we tried, we can only give this Nautilus a “Not Recommended”. UPDATE: See the Denali Soundbomb Horn Review. A nearly identical replacement for the Nautilus that works. Take what we said about the Stebel Nautilus “Max” and repeat it here. Both of the Nautilus horns we purchased came from different retailers in different countries, bought months apart. This one never worked, and we’ve heard from other Stebel Nautilus owners who experienced similar problems. Apparently, the Nautilus can fail early, suddenly or unexpectedly after an indeterminate amount of time. Reports have indicated that any water that enters the horn can also cause it to fail. Like the Stebel Nautilus “Max”, the Nautilus Compact horn is large and has a very irregular shape. This and the very awkward mounting bracket makes it very difficult to fit on a motorcycle. Owners would probably have to fashion a custom-made bracket of some sort to use this horn on a motorcycle. It would be nearly impossible to mount anyway on the slim GT1000 and who knows how it would sound when the horn was pointed downwards, to keep out water, as the instructions indicate. 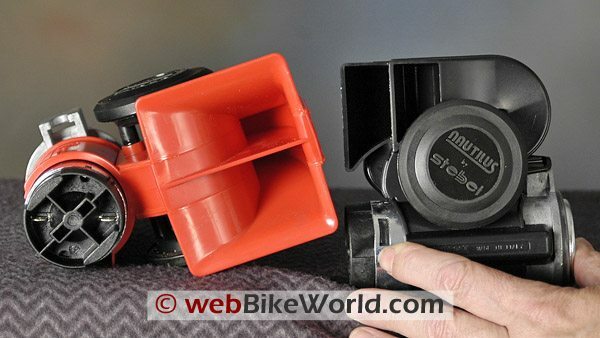 But the loudest motorcycle horn in the world is useless if it can’t be trusted, and based on our experience with the Stebel Nautilus Compact horns, we’d rather take a few less dB but have something that’s going to work when needed. We recorded the sound made by the Nautilus Compact when it isn’t working; see the sound file table in the horn comparison home page. (L) Stebel Nautilus “Max”. (R) Stebel Nautilus Compact. The Stebel Nautilus by David G.
A relative of the big trumpet-style horns you see on freeway trucks, the Nautilus combines compressor, diaphragms and a pair of high/low molded trumpets in a single assembly. Delivering a claimed 139 decibels, this sucker isn’t set to stun, it vaporizes. Originally designed for autos, the Nautilus’ one-piece feature is the main problem when it comes to installing one on a motorcycle. At 4.5 inches wide, 4.5 inches tall and 3 inches deep, there are not many places you can hide it It also weighs 1-1/4 pounds. 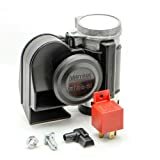 The package includes a relay and has a single, off-center pot metal bracket for installation – but this is rather like trying to hang a brick with a single screw. Installation can be a major issue, partially because the shape is very complex and doesn’t lend itself to mounting alternatives. You can add a clamp to the bottom of the compressor to help secure it but that’s about all. My suggestion to potential buyers is to cut a block of wood roughly matching the horn’s dimensions and shop for suitable locations. Make a variant with separate horn and compressor units and rubber tube fittings. Provide multiple, flexible mounting approaches. Replace the miniscule instruction sheet with a paper you won’t toss with the packaging and don’t need a microscope to read. Under the fork spreader but pay attention to wheel travel. Hondas and other cruisers have big beefy passenger footrest mounting brackets. This is actually an “old school” location. Harley horns are routinely placed on the side behind the rider and most sport bikes have room on their sides aft for brackets. I even considered installing the horn inside one saddlebag with a black grating to cover the opening (but didn’t want to be made deaf by sitting in front of the horn’s business end). Check out your headlight support bracket. Engine guards are ideal but you’ll probably want to use a chrome model. If you opt for a location where the Nautilus is pretty much dangling out in space, consider adding a tether cable so your horn stays with you if the bracket lets go. Hint One: you can get woven stainless fishing leader by the foot from sporting goods stores. Hint Two: adding a small piece of aluminum or steel “L” (a.k.a. angle iron) with a hole for the mounting bolt will prevent the horn bouncing off if the bolt loosens Star washers and jam nuts are a good addition. We can’t recommend a horn that didn’t work. 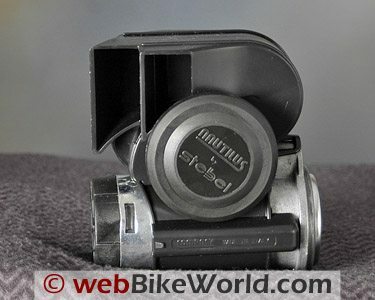 We’ve read many reports from owners on problems with the Stebel Nautilus Compact, so until someone can convince us that the issues have been resolved, these get a “Not Recommended” rating. From “B.P.” (January 2013): “There’s no arguing with anyone’s being dissatisfied with the Stebel Nautilus Compact Horn if you’ve had one or more arrive DOA. The good news is that I assume a buyer would not having a problem returning one right away (although I could be wrong, because I’ve seen some prohibitions regarding returning electrical products). My own experience has been quite different, in keeping with David G.’s write-up. I bought my first Stebel Nautilus Compact from … in 2007, and used it without incident the five years I owned my Burgman 650. I bought my second from … in Feb., 2012, and also had no problem with that on my Victory Cross Country Tour this year. I think the keys — assuming that you don’t start out with a dead one — are to locate it in an area largely protected from the elements, make sure the horn or at least the trumpet openings are pointed down, and of course power it via a relay. From “P.A.” (06/2011): “I’ve had the same Stebel Nautilus Compact horn on my ’95 FLHT bagger since 2006. It has worked flawlessly. I separated the compressor from the trumpet, and installed the compressor in front of the battery in an upright position. The trumpet fits under the stock chrome horn cover, on the engine’s left side. I linked them with a length of 1/4” rubber hose. My install is here. From “C” (6/10): “Thought I’d share my experience with the Stebel Nautilus Compact air horn. The horn itself is compact and will fit on most faired and unfaired bikes without too much effort However, as with anything that isn’t OEM, some degree of craftsmanship is required to mount it securely. I have two, one that has been on a ’96 Honda VFR750 for a little more than two years and one that I just recently installed on a ’07 Buell XB12S. The VFR required custom brackets to securely mount the horn under the radiator overflow tank and the XB12S is securely held in place between the OEM Fly Screen and dash mounting frame. A couple strips of foam rubber provide vibration isolation and the horn appears to function just the same as the one on the VFR, if not slightly muffled due to the “closed” location behind the Fly Screen. I commute on the VFR and the horn gets tested daily once I get outside of the neighborhood in an effort to keep the peace with my fellow homeowners. Additionally, the horn gets exercised 2-3 times a week to let cagers know I’m right beside you so quit coming over into my lane. I would estimate the Stebel horn on the VFR has seen roughly 15,000 miles from sweltering summers to cold winters and wet spring/autumn days. The horn on the Buell has only seen 100 or so miles so it’s a bit early for long term reviews on that bike.